Let me draw your attention to Tuesday. I burned a lot of calories through exercise that day–in the morning I lifted weights and did some light cardio, and after dinner I played a very intense game of Ultimate Frisbee with a group of friends. The game was four-on-four, which means we all did a lot of running (with so few people on each team, you really cannot take a break,) and the only other girl playing (opposite team) was very comparable to me in terms of physical abilities (speed, willingness to crash into someone to catch the frisbee ;-)), so I was giving my all the entire game. When we arrived back home around 9 PM, I had a substantial snack, but according to MyFitnessPal, I still fell way short on calories (and fat) that day. Wednesday was a different story, however. I took it easier with my exercise, but I was so much hungrier as a result of the previous day. MyFitnessPal is just a tool and does not recognize that hunger can carry over, so on Wednesday I exceeded my recommended calories, fat, and…well, everything! I think it would have been detrimental to my health to adhere strictly to what the app said I needed–my body knew it needed more. My point is, this app is a great tool for getting the nutrients you need, but it doesn’t know your body as well as you do. Listen to and honor your body! This entry was posted in Fitness, Food and tagged cardio, fitness, food, health, myfitnesspal, nutrition, running, workout by Catherine @ A Two Storey Home. Bookmark the permalink. I love how over the years I’ve become more and more attuned to myself and have more conviction in ‘listening to myself’. In the past I’ve used my fitness pal but I’m the type of person who likes to ‘follow by the rules’ (boring or what 😉 ) so was getting incredibly frustrated when I was going over on targets/or not meeting them (but really I was just doing what my body needed)! Eventually it was driving me bonkers so I quit and it was the best decision for me. I know lots of people who find it really helpful though, especially if habits have been formed a long time ago… Now I just go on how I feel, with a little bit of thinking mixed in too 😉 ! Totally agree. 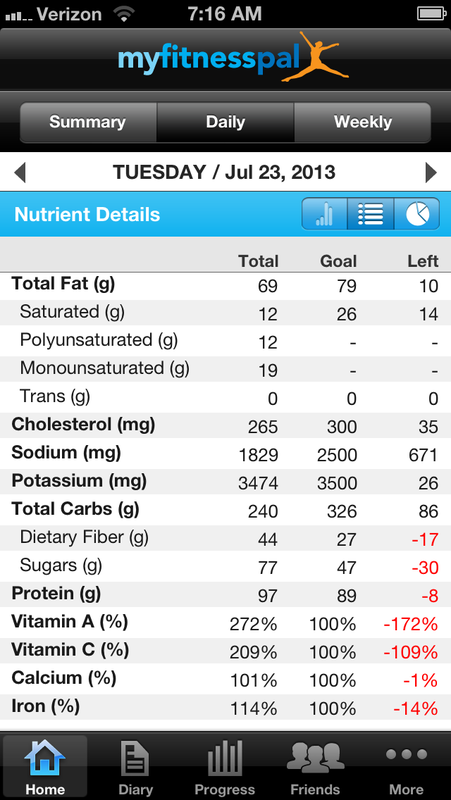 I love MFP because it helps me have a clue of what I’m eating – but I think it’s dangerous to rely on it solely. Looks like an awesome active week for you! I use mapmyrun but its the same concept. The app doesn’t recognize the fact that hunger does carry over and so on and so forth. I stopped inputting my diet and kept with tracking my fitness. I think its a much better way to go about it. Yeah, I agree! We know our bodies better than an app does. It is good to track fitness though!